Alabama folks will agree it’s just not Halloween without a visit to a haunted house (or two). Throughout the state you’ll find a variety of haunted house attractions begging for victims—err, visitors—to enter. From terrifying asylums to spooky graveyards and ghostly manors, there’s no end of chills and thrills to set your Halloween spirit free. Save your voice (you’ll need to scream) before embarking on a monster-filled journey at these 10 best haunted attractions in Alabama. 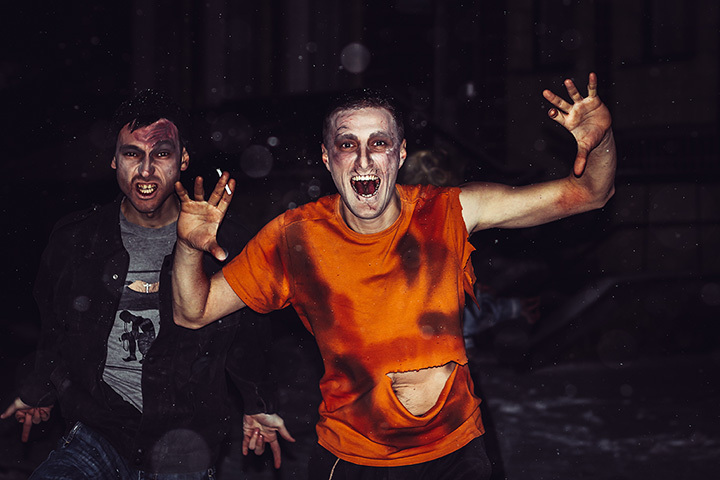 Throw yourself into darkness and stagger your way through the horrors that await you at Nightmare at 3008. There’s a good reason you’ll feel like you’re not alone here, and your imagination alone may be enough to send shivers down your spine. If you make it out alive, see if you can double your luck with a trip to the escape room. One of the largest haunted attractions in the state also happens to be one of the biggest nightmare-inducing ones. The House of Dolls is pure terror, bringing your deepest, darkest childhood fears to life. Situated on an historic site that used to be the home of old plantations and a former Indian village, don’t be surprised to see some real ghosts among the actors. Set in a place with a name like Killen, you know the scares here are nothing but top notch. Translated as the “Castle of Death,” this truly terrifying haunted palace will have you screaming for your life. Hollywood-quality special effects, animatronics, makeup, and scenery create a stunning experience you won’t soon forget. That is, if you survive. Touted as one of Alabama’s best haunted attractions, the Insanitarium is crawling with the biggest frights in the state. The attraction continues to grow each year, serving up scares at every angle and creating a unique experience every time. This place is truly the stuff nightmares are made of, and a trip here may mean sacrificing a good night’s sleep. Guests have dubbed this attraction as the scariest in Birmingham, and for good reason. Once the door slams shut behind you, you may feel like you’ve sealed your fate. And the only way to safety is by wandering through nearly 30,000 square-feet of spooky twists and turns full of your worst fears—will you make it out alive? Any haunted house can hire actors to jump out and scare you, but it takes a true horror genius to create a truly terrifying experience, which is exactly what you’ll find at Atrox Factory. The creepy factor here runs rampant, sending chills throughout your body and heart racing out of control. With over 50,000 square-feet of sheer terror, you may feel like it takes a lifetime to make it through. There’s a variety of haunted attractions at Hellbilly Hollow, but the haunted house is not to be missed. Make your way through a series of twisting, creepy hallways and rooms while avoiding nightmarish monsters and other frightening sights within. If you make it out alive, take a tour through the haunted swamp where ghostly creatures come out to play. Both haunted house and haunted castle ride are not to be missed at the Terrortorium. Inside you’ll discover a truly terrifying experience from floor to ceiling that looks a little too real for comfort. Every inch of the attraction is brimming with a level of spookiness you just won’t find anywhere else, making it a must-do this Halloween season. This haunted hayride is no walk in the woods—once on board, there’s no way to run for your life. If you’d rather make a quick getaway, you can embark on the Trail of Fear on foot, but beware—there’s danger lurking behind every tree and around every turn—and you might not see it coming! While many haunted attractions rely on actors and makeup for a scary experience, few have what makes Lester Haunted Hospital a truly horrifying journey: real paranormal activity. The facility served the community as a real functioning hospital for 50 years, and not all who passed through its halls during that time left. Aside from the man-made scary sights inside, you may get a little more than you bargained for if the ghosts decide to come out and play.